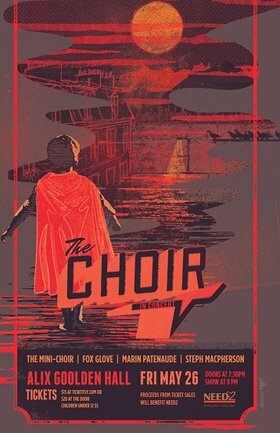 The Choir is itching to perform their new and thrilling repertoire including Heart, Feist, Stars, Wilco, Kinks and more! And they're even more excited to welcome Fox Glove, Marin Patenaude, and Steph MacPherson as special guests. The Mini-Choir opens the show. Proceeds from ticket sales will benefit Need2, a Victoria-based Suicide Prevention and Support organization. 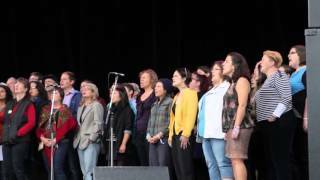 Victoria’s The Choir is a non-auditioned, community choir that sings all-original arrangements of pop, folk and indie music. What started as a small project based out of Larsen Music in early 2013 turned big in no time: 100 great people who love to sing their hearts out! The Choir has had a string of very fun and successful concerts, and performances at Rifflandia 2014 through 2106, and the 2015 Campbell Bay Music Festival. They've taken the stage with Rae Spoon, Hank Pine, Adam Cohen, Kathryn Calder, Pharis and Jason Romero, Choir!Choir!Choir!, Aidan Knight and more. The Choir is directed by Marc Jenkins and accompanied by Erin Gray. Making music since she started making noise, Steph Macpherson's passion for music and love of lexicons allow her to invite you into a world of clever yet relatable imagery using her hauntingly beautiful vocals and a tone which is only her own. Some have described her as a splice of Stevie Nicks, Sarah Harmer and Jeff Tweedy rolled into one musical entity, with a touch of Dolly Parton-esque vibrato, and Feist-like charm.